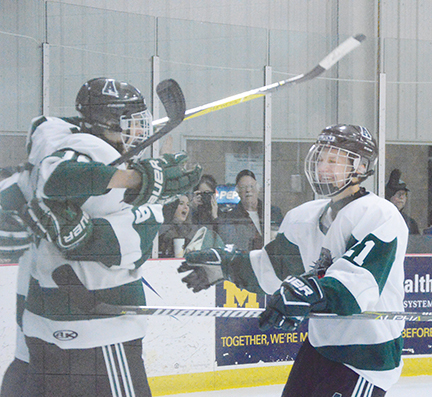 News Photo by James Andersen Alpena’s Alex Cosbitt, far left, celebrates a second period goal with teammates Sean Stevens and Kyle VanDusen (21) in the second period of a hockey game on Monday at Northern Lights Arena. 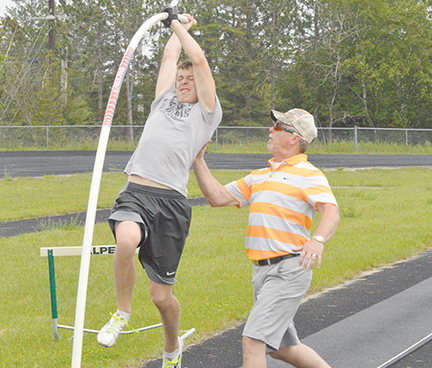 The Alpena High School hockey team is another step closer to the Big North Conference title. Kyle VanDusen and Alex Cosbitt each scored and the Wildcats topped Gaylord 5-2 on Monday at Northern Lights Arena. The game was a continuation of a contest that began on Jan. 18, but was stopped after one and a half periods due to poor ice conditions. At the time of the suspension, the Wildcats (17-4-1) held a 3-1 lead with 8:30 left in the second period. 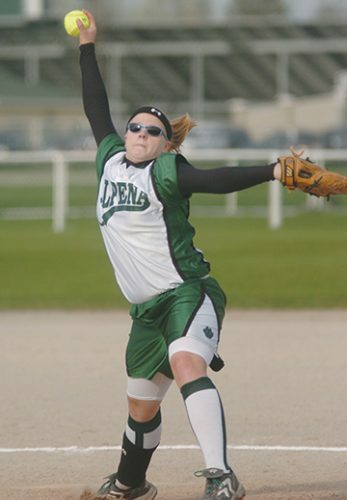 VanDusen officially registered a hat trick in Alpena’s victory and Cosbitt and Keegan Matthews each had a single tally. 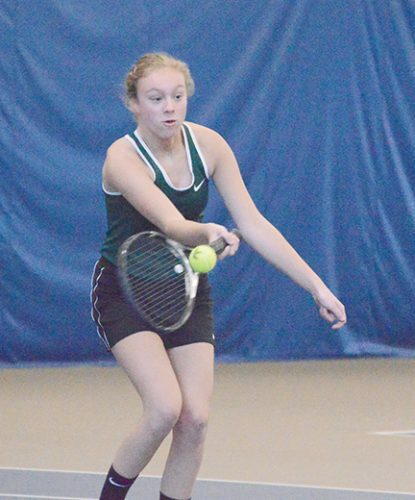 After nearly a month, play resumed Monday around 8:40 p.m.
With the victory, Alpena is now 6-1 in conference play with home games against Cadillac and Traverse City Central on Friday and Saturday. Armed with a 3-1 lead on Monday thanks to two goals from VanDusen and one from Matthews, the Wildcats still kept Gaylord goaltender Caleb Pettis busy. Alpena finished the contest with 33 shots on goal, with 12 of those coming on Monday. Cosbitt gave Alpena a 4-1 lead with 28 seconds left in the second period. Cosbitt found himself alone on a breakaway and moved in on Pettis. Cosbitt missed his initial shot, but was still able to corral the rebound and tap it in for the score with an assist from Owen Limback. Alpena went into the second intermission with a 4-1 lead, but the Blue Devils gained one back with 14:24 left in the game when Sean Jardine put a shot past Alpena goaltender Cooper Black. Jon Allen was credited with Gaylord’s other goal and scored on an assist from Colton Hurst back in January. Gaylord pulled Pettis late in the final frame for an extra attacker, but VanDusen squashed any attempts at a rally with an empty-net goal with 49 seconds left. Colby Plowman earned an assist on VanDusen’s goal. Alpena outshot Gaylord 33-23 for the game and Black earned the win after making 21 saves. 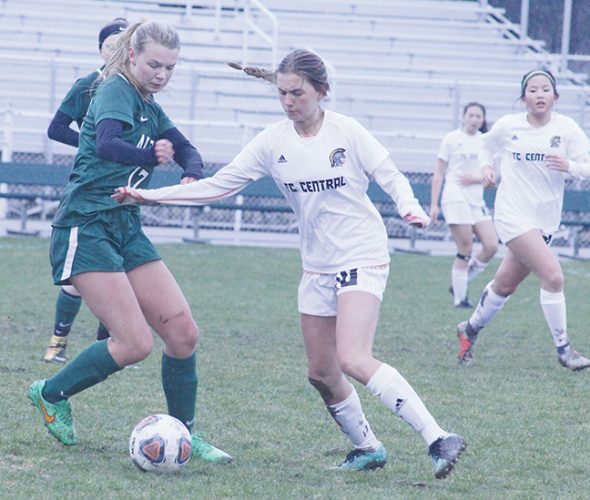 With 12 points in conference games, the Wildcats are getting closer to clinching the Big North title and VanDusen said Alpena will have to keep playing hard to achieve that goal.